Ok, I’m standing at the gate with my carry-on bag, waiting to board my flight when an airline staff approaches me. After a quick check, I’m told that my bag is a tad too big and I have to check it in… and there’s a fee for that. I would then argue that I’ve used this bag many times before and there was never a problem and I would receive the same response: each airline has different requirements. This has happened to me several times and, yes, it’s annoying. About a month ago, I was approached by FlyLite, a manufacturer of lightweight luggage who asked me to test their product. I don’t often do product reviews but considering my experiences, this was one product I certainly wanted to try. 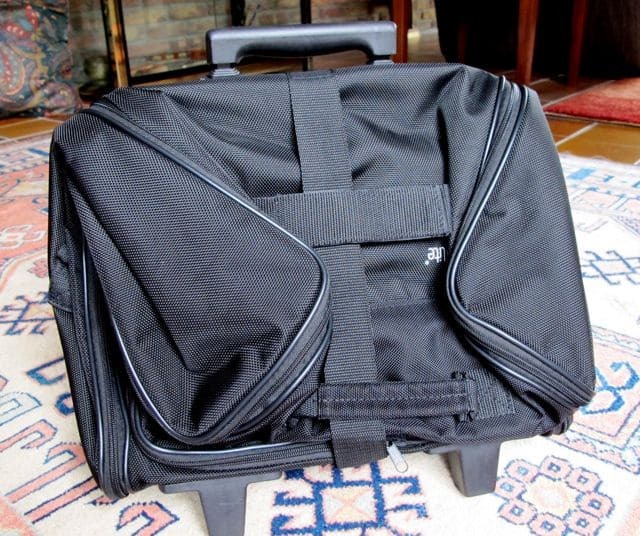 I opted for the MultiBag Foldaway Wheeled Cabin Holdall (wow, that’s a mouthful!). It arrived in a small, neat package and I stared at it for a while. It was so small and light! My Flylite bag folded up. Along with the bag came instructions and a list of airlines. The bag could be changed into six different size configurations. 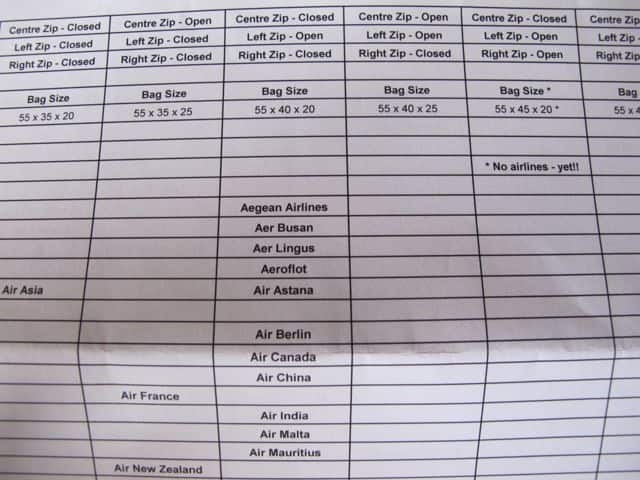 The list shows you how to alter the bag’s size depending on which airline you’re flying with! For instance, according to the list, KLM has a cabin bag size limit of 55 x 35 x 25. For this configuration, the bag’s left and right zips should be closed and the centre zip open. Brilliant! List of airlines and their cabin luggage limits. I soon had the opportunity to take my new bag for a spin… in Madrid. It certainly is lighter than my Samsonite carry-on luggage – which exceeds 8kgs with a laptop, a pair of shoes, toiletries and a few pieces of clothing. My Flylite bag was more than a kilo lighter with the same items. Thumbs up for that. Aside from a small external compartment (a folded A4-size paper fits snugly into that space), there are no other compartments. I would have preferred a separate sleeve for my laptop/iPad to keep it in place. What I really liked about the bag is the fact that you can roll it around on wheels or carry it as a backpack – I like these options as there’s no pleasure in dragging your bag on an unpaved surface or even worse, a muddy field. The telescopic handle and the wheels are sufficiently sturdy and handled Madrid’s streets with ease. On a whole, I’m very pleased with my new Flylite MultiBag Foldaway Wheeled Cabin Holdall. It’s light and strong, and the various size configuration options are very handy. Would I recommend it? Absolutely! I always try to travel as often as possible with only a carry-on so this bag is perfect! Check out my travel planning page for more travel tips and resources. Note: Flylite provided the bag for my review. As always, opinions expressed above are mine, and mine only. John tells us about this fantastic lightweight bag that he uses but does not tell us the name and where we can get it. I have spent most of today looking at different carry-on bags and I have found nothing suitable so can John please let me know the details of his fantastic bag. I agree 2.3kg for the Flylite is a bit heavy when our local airline Thomson only allow 5kg carry-on. To buy a bag suitable for all airlines you will have to use the lowest of the maximum allowances for all airlines. For most travellers the deciding airlines will be KLM, Alitalia & Air France at 55 x 35 x 25 and Easyjet option 1 at 50 x 40 x 20. 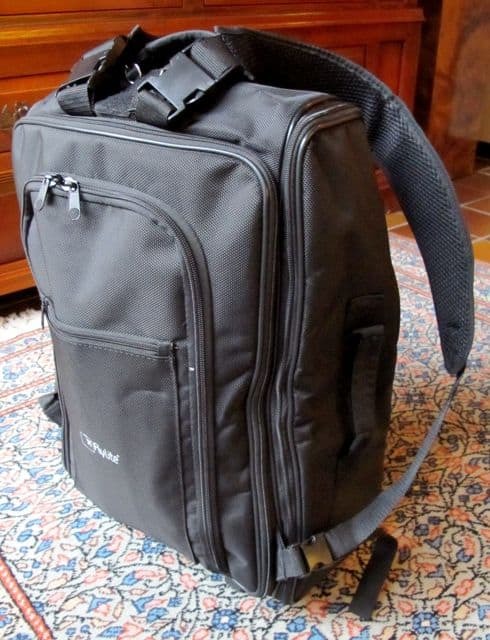 This gives bag size suitable for most airlines of 50cm x 35cm x 20cm (19.7”x13.8”x7.9”), incl wheels, handles etc. UK Travellers may incorrectly believe that Ryanair has a reputation for being very tight on size allocation so they could use a Ryanair bag with other airlines. They would be caught out if they tried to use that bag on many airlines that have a height restriction below 55cm or a width restriction below 40cm (especially in the USA). Thanks for your comment John. You sure know your luggage. Just went to the link for the product. It weighs 2.3kg. That is heavy! I’ve got a bag weighing 900grams with pockets plus sections for my laptop and A4 travel documents. It is small enough to go with all the airlines I’ve used. We have done around the world twice, UK/Europe return, Hawaii & New Zealand, etc Even flown Flybe with it. Have also used it as a second checked bag with about 16kgs in it. So why bother with this Flylite product? At 7kgs for your Flylight, you are down to 4.7kg of contents . I can do 6+kgs. I don’t have to carry around a guide re zipping it however. Mine is a bit like the other Flylight products in price and features (645g – that’s great!). Ok – no wheels. But a strap for it to sit on top of my main case handle – which a lot of wheel-ons do not have. Means I can move both main case and take on case as one piece with one handle. Got a wheel on at under 2kg which also fits the bill, if that’s what I want. BTW: I also have an Antler wheel on which weighing 4kgs! It’s not meant for flying but for office, with lots of sections padding etc. Traveling light can be a challenge sometimes, but it looks like that task just got easier with the Flylite …where do they sell them? What a good review. My wife and I are travelling overseas late August and have already purchased our luggage otherwise I would have had two of these bags. Size of carry on bags can be a problem sometimes and this bag seems to have that covered.